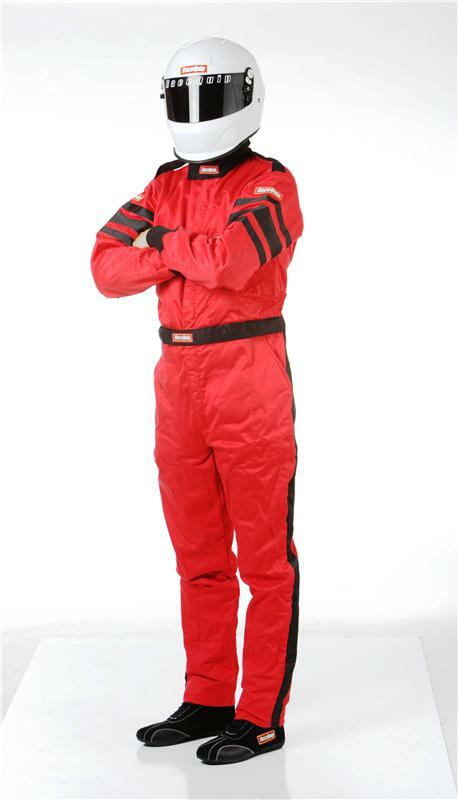 The RaceQuip 120 series multi-layer suit is made up of a shiny outer layer of durable Pyrovatex® FRC, backed by a layer of Nomex®, then lined by a soft layer of Pyrovatex® FRC. This Nomex® and Pyrovatex® layered construction offers the maximum combination of overall flame and heat protection, durability and comfort for the price. Pyrovatex® FRC fabric is gentle and non-irritating to even the most sensitive skin, and since it retains the softness and breathability of cotton it will wick away moisture from the skin.. The treatment process leaves the exterior surface shiny and supple. Since the Pyrovatex® treatment is absorbed into the cotton fibers at the molecular level, with proper care; the garment will retain its flame retardant properties beyond the useful life of the garment. All suits are assembled with heavy-duty, multi-needle, over-lock safety stitch machines to provide exceptional seam strength. A high quality, heavy-duty two-way YKK zipper built on FR tape is installed with a double overlap for a more secure front opening. Black suits feature white armband stripes with black leg stripes. 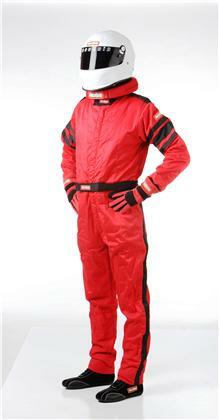 Red and Blue suits have stylish black contrasting armband and leg stripes. 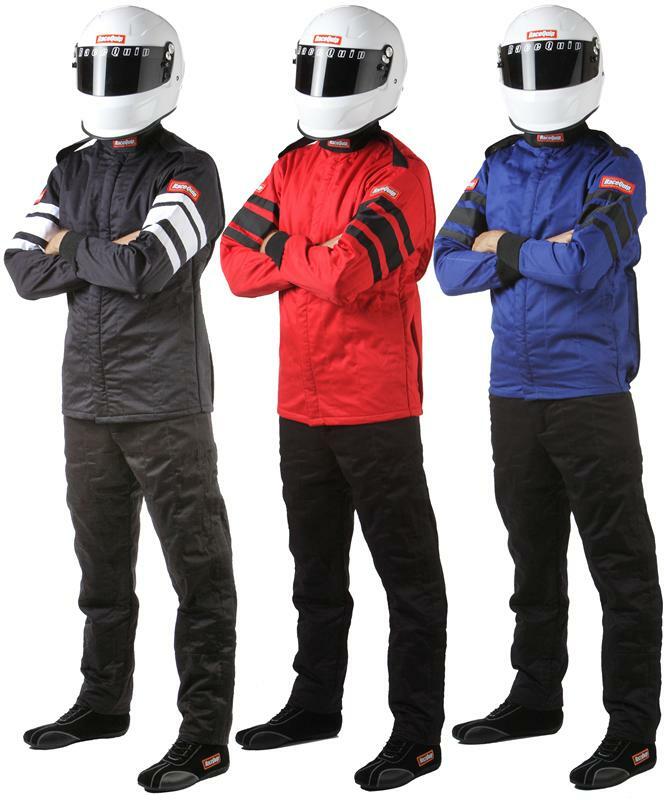 The black accents: high-back collar, leg and arm cuffs, epaulets and beltline, give RaceQuip 120 series suits a unique look and style. Add to this the pleated back panel for freedom of movement, boot cuffs, deep bag pockets and the adjustable euro-style belt, and you have a multi-layer suit that provides an outstanding value. Meets or exceeds SFI 3.2A/5 specs with a TPP rating of 25. Stocked in sizes Small – 3XL (refer to sizing chart).